Display Analysts from DSCC says that 2017 was a record year for the display equipment market, with revenues reaching a record $24.7 billion (up 30% from 2016). OLED spending reached a record $15.5 billion - a 143% increase over 2016. Samsung's share of the OLED equipment market was 48%, followed by BOE with $24% (following a 229% growth from 2016). OLED equipment revenues represents 63% of the entire display equipment market, surpassing LCD - which saw revenues dropping 27% from 2016. In 2018 DSCC sees the equipment market falling 9%, although booking will increase as growth will resume in 2019. The main reason behind the decline in 2018 is due to Samsung which will reduce its equipment orders by 64% in 2018. 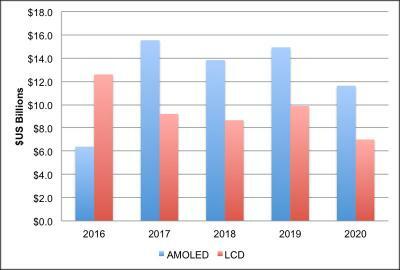 2018 is expected to be the first year where China leads in OLED spending with a 64% to 36% advantage over Korea.